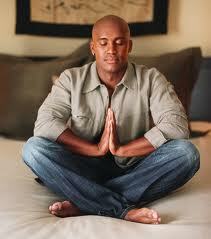 Meditate for 15 minutes a day – sit quietly with your back straight, close your eyes and focus on feeling your energy. Imagine a tree root (big and thick) extending from the base of your spine into the earth. Watch it travel deep into the earth. Take long, slow, deep breaths, in through the nose and out through the mouth. If it is difficult for you to clear your mind, try to watch it without attachment. Let it wander but notice if you become “involved” in the thought process and let go again. It helps to imagine erasing your mind like you would erase a chalk board. You can do this each time you feeling yourself thinking in order to clear it again. It gives our active minds something to do. You can also, imagine a stream of energy flowing up from the earth into your spine and traveling all the way up and out the top of your head. Now imagine the same thing in reverse – a stream flowing down from the universe into the top of your head, down your spine and out into the earth. You can imagine the stream coming up as you breathe in and the stream going down your spine as you breathe out. Long. Slow. Breaths. Meditation can really impact our productivity by increasing our attention span. It allows our bodies to process emotions and our minds to release fear, worry, and anxiety. It will improve our relationships and keep us connected and focused on our goals.